Using your owned media including your website traffic, social media properties, and emails, let your customers know that they can refer their friends and family. Customers share with friends using email, social networks, and personal share codes. 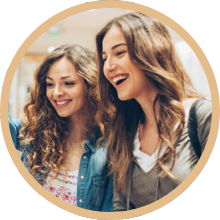 Referral programs offer referred friends an incentive to purchase. An authentic recommendation from a current customer -- along with a reward -- encourages friends to respond. They click and land back on your site. A friend purchase triggers rewards for both the friend and the advocate. Customers acquired thanks to your advocates are your best customers! Your advocate gets a reward for driving a qualified conversion. It's a win-win-win. You identify your best customers - your advocates! Knowing exactly who your advocates are helps you market more effectively to this important segment. Through easy to understand analytics, rich A/B testing, and segmentation, you extend the reach and impact of your most important acquisition channel. Learn from our customers' success building advocacy and referral programs. Extole's platform helps identify, activate, and engage your advocates.